On January 16, Fr. 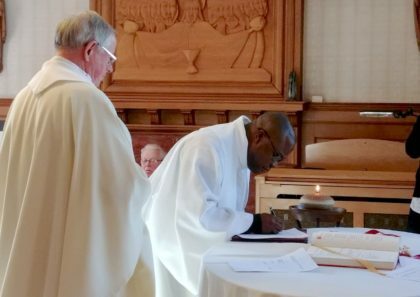 Gustave Lulendo, SCJ, was installed as regional superior of Canada. He succeeds Fr. John van den Hengel, SCJ, who continues to serves on the Regional Council. A generation apart, both are immigrants to Canada; both are naturalized citizens. Fr. John, 79, represents the face of immigration in the mid-20th century: his family came to Canada from the Netherlands. Originally from the Democratic Republic of Congo, Fr. Gustave, 45, symbolizes today’s increasingly multicolored tapestry of immigrants. He also represents the growing impact of the southern hemisphere in not only the worldwide congregation of the Priests of the Sacred Heart, but in the Church itself. A few days before assuming his new role, Fr. 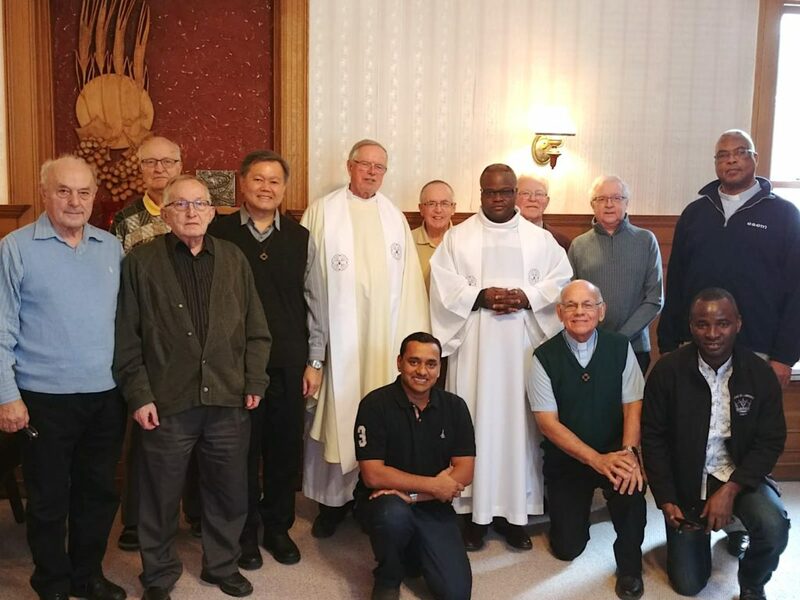 Gustave did a Q&A in which he reflected on his vocational call, his path to studies in North America (including ESL at Sacred Heart Seminary and School of Theology), his growing role in the Canadian Region as well as international experiences through theological conferences and commissions, as well as at the 2018 General Chapter. The following answers are paraphrased from the original French. QUESTION: How did you first learn about the Priests of the Sacred Heart (Dehonians)? When did you begin to feel your vocational call? FR. GUSTAVE: I knew the Priests of the Sacred Heart from a young age in Kinshasa; they ministered at my home parish of St. Camille. In 1988, I went to study in Kisangani and unknowingly found myself again at an SCJ parish (St. Joseph Artisan of Tshopo). But I must admit that, as a child, I did not know the difference between diocesan and religious priests. For me, there were simply priests, and all had the same mission: to evangelize and take care of the parishes. It was not until I began my vocational discernment at the age of 16 that I learned the difference. The testimony of the SCJ priests that I have known and their pastoral commitment to the poor have always fascinated and inspired me. I wanted to be and serve like these valiant missionaries. It was with a Canadian Dehonian that I began my vocational journey in Congo. There have been the ups and downs, and the joys and sorrows that are found in any journey. But I continue to feel the same initial call to put myself at the service of others, to the congregation and the Church, through the spirituality and charism of our founder. QUESTION: As a young seminarian, how did you envision yourself serving as a Dehonian priest? FR. GUSTAVE: Already as a novice I expressed my desire to our provincial superior, Fr. Matthias Hansen, to serve in a parish or as a formation director. I was told that there was a need not only for formation directors, but philosophy and theology instructors, teachers who were prepared to address the challenges of today’s world. This was interesting to me, but I knew that I had a long road ahead of me, preparing for my vows and ordination. I was open to serving the needs of the Congolese Province, whatever they might be. QUESTION: Your first visit to North America was as a student in the ESL program at SHSST. How did that come about? GUSTAVE: I have been fascinated by languages since I was a young child. French is the official language of DR Congo, but there are also four national languages. [Fr. Gustave speaks three of the four] As a student in Kisangani, I enrolled in an English language course at a local church, but without any objective other than to expand my language abilities. I did my theological studies in Cameroon, a bilingual country [French and English] and was able to spend three-months in an English program. In 2004, at the end of my theology studies, I asked to go to the ESL program at Sacred Heart in Hales Corners. I was granted permission and initially did a three-month summer session. I would later return to SHSST for continued ESL during my breaks from studies in Ottawa, Canada. I do not consider myself fully fluent in either English or French, since neither is my first language, but I am improving. In today’s world, knowing English is especially important. QUESTION: What led to your studies in Canada? FR. GUSTAVE: In 2004, Fr. 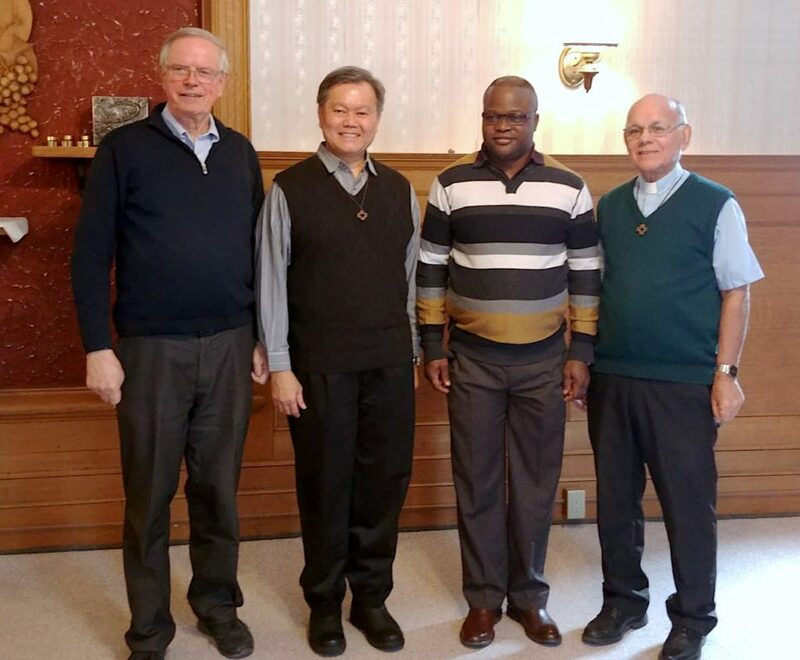 John van den Hengel spoke to the provincial superior of Congo, Fr. Wilson, during a major superiors meeting in Poland. Fr. John told Fr. Wilson that the Canadian Region would welcome a Congolese confrere for advanced studies in Canada. Fr. Wilson suggested that I go. After both the Canadian and Congolese councils agreed, I began a year-long process to obtain my student visa. My first request was rejected. I finally arrived on January 8, 2008, three days after the first class began at the University of St. Paul in Ottawa. Our confreres – who warmly welcomed me – were very active with the university. QUESTION: What was the focus of your studies? FR. GUSTAVE: I earned two degrees from St. Paul University. Initially, I was working toward a degree in Moral Theology, which I obtained in 2010. My research project was on “responsible fatherhood.” Much of my work centered on the street children of Kisangani; the Priests of the Sacred Heart minister to these children through the St. Laurent and Bakhtia Centers. After earning my master’s degree, I began doctoral studies, eventually doing my coursework and comprehensive exam through Dominican University College in Ottawa. I received permission to begin writing my thesis, which would focus on the limits and challenges of bioethics in the African context. For a variety of reasons, I did not see myself completing the work in a timely manner, so I returned to St. Paul to earn my ecclesiastical license, which would allow me to teach at the university level. In 2016, I completed that degree with a thesis titled: “Environmental Ecology and Human Ecology in interaction. A holistic reading of ‘Laudato Si’ by Pope Francis.” In this work I tried to put into dialogue the encyclical of Pope Francis and the German philosopher Hans Jonas with his principle of responsibility. QUESTION: You have participated in several international theological gatherings and now serve on the North American Theological Commission. Can you reflect on that a bit? FR. GUSTAVE: It was through the initiative of Fr. John van den Hengel, who was then on the General Council in Rome, that I took part in the theological seminar in Taubaté, Brazil. The theme was “Anthopologia Cordis,” which offered me a framework for research and a deepening of my knowledge in this area. As a member of the North American Theological Commission I am working with others to coordinate theological reflection and deepen the experience of our charism and our spirituality in a North American context. The question of the enculturation of the Gospel message and its impact in everyday life is something that is close to my heart. How does one be authentically Christian and Dehonian while also maintaining his cultural heritage? QUESTION: When did you decide to become a member of the Canadian Region? FR. GUSTAVE: Typically, after at least a year of being in the Canadian Region, an SCJ is welcome to become a member so that he may fully participate in the life of the region. I became a member in 2013, though it felt like a formality since as of my first day in Ottawa I felt at home, fully Dehonian, in Canada. In no way did I consider myself a visitor or stranger. QUESTION: You are now superior of the Montréal community and represented the region as a delegate to the 2018 General Chapter. Could you speak about those appointments; what they have meant to you? FR. GUSTAVE: My appointment to the Montréal community was a surprise for the simple reason that I had never lived in this community. At the same time, it was a great mark of confidence on the part of the confreres in Montréal because without knowing me thoroughly, I was accepted as a member of the community in a leadership position. There has been a good sense of collaboration and community among us that is based in fraternity. My election as a delegate to the General Chapter was another sign of the confreres’ confidence in me, to be their representative at a meeting of this magnitude. The most moving moment for me was the very unfolding of the chapter, which was a time of grace for the entire Congregation. 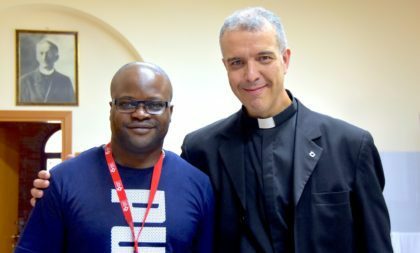 I experienced internationality and Sint Unum, and became more aware of the major challenges of the Congregation. The emergence of the Dehonian presence in the southern hemisphere is both a challenge and a blessing. The Thanksgiving Mass celebrated at the Basilica of St. John Lateran was an important moment for the whole Congregation. One felt pride in being a disciple of Fr. Dehon. The election of the new general administration was another way in which we felt the hand of God acting through us, fragile beings. QUESTION: And now, just over ten years after you first set foot in Canada, you have been named the region’s superior. Please share a bit about this. FR. GUSTAVE: My appointment as Canada’s Regional Superior is a concrete sign of our Sint Unum. It is a special event at an individual level but also at the congregational level. For me, this clearly shows that internationality and fraternity are not mere slogans but realities that we are experiencing. 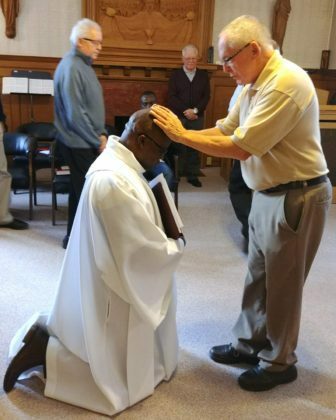 I hesitated to accept, but through my confreres I understood that it is by walking together that we can follow the model of service given to us by Christ. I think that this role of superior will help me to better know the confreres as well as their needs, their projects and their expectations for the future of our entity. Because of that, I remain confident in the future and I am very optimistic about where Providence will lead us. This new role that I am called to exercise in the Canadian Region remains under the mark of service and not of power. I consider myself simply a confrere, first as a member of my community in Montréal and then a guide for the needs of the Canadian Region. My African origins do not have an impact in the acceptance or the exercise of this function, because, as I said before, I have always considered myself first as a Dehonian among the Dehonians before thinking of my African origins. Most of my priestly ministry has been in North America. In Canada I am called to be a witness of our charism in the same way as all the other members of the Region. I do not consider myself a missionary in Canada but instead, as a member of a large religious family, as I said, as a Dehonian among Dehonians. I do not represent Congolese culture in Canada, but live Dehonian values, as a Congolese and a Canadian, in a North American context. QUESTION: You recently became a Canadian citizen; was this because of your growing commitment to the Canadian Region? FR. GUSTAVE: I first thought about becoming a Canadian citizen because since my first moments in this country I began to adopt it as mine. Having Canadian citizenship and a passport is the culmination or materialization of an experience that has already been begun and lived. There is a sacrifice – I gave up my nationality of origin – but also opportunity. Travel will be much easier for me; there will be less paperwork in the constant efforts for visa renewals. But the decision to become Canadian is so much more than this. Becoming Canadian is a way for me to more fully participate in the life, hopes, concerns and challenges of all Canadian citizens in general, but especially, of my fellow Canadian Dehonians. Daily sharing in their reality not as a temporary spectator but as a fellow Canadian is a sign of integration and of mutual acceptance. Canadian citizenship has nothing to do with my function as regional superior. The confreres placed their trust in me because of who I am. I cannot say it enough: what binds us is our common heritage as Dehonian religious, which has no particular face or color except to the extent that we are worthy spiritual sons of Fr. Leo John Dehon. QUESTION: Do you have anything else that you would like to share? FR. GUSTAVE: I thank the confreres who have agreed to work in the new regional administration and all the confreres in the Region of Canada for their support and their concern to collaborate in this mission. I count on our ability to work together and I am confident that Providence will help us to meet the challenges of our times as Dehonian religious in Canada.